In honour of this year’s 50th anniversary of You Only Live Twice, I got an Anthony Sinclair shirt and Anthony Sinclair trousers from Mason & Sons to replicate the look of one of Sean Connery’s casual outfits from the film. 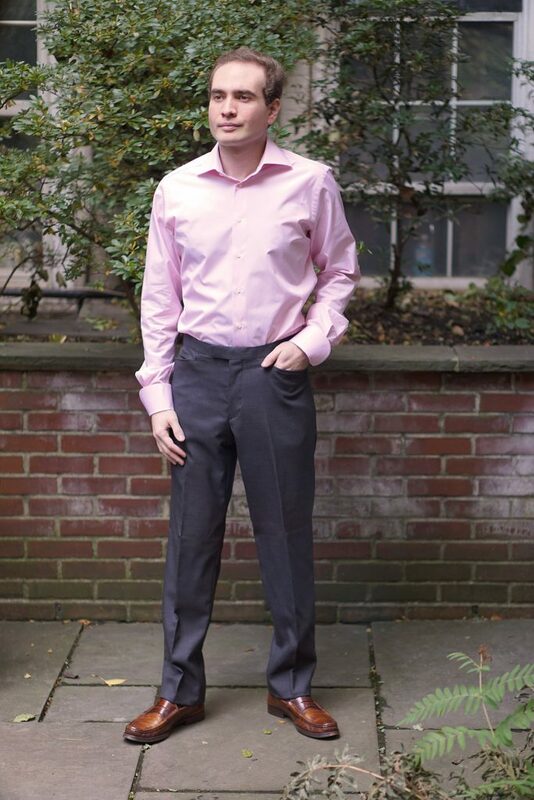 This casual outfit is made up of two versatile Anthony Sinclair Special Order items: a pink shirt and dark grey trousers. David Mason of Mason & Sons assisted me in finding the best fabrics for the shirt and trousers to recreate this look. 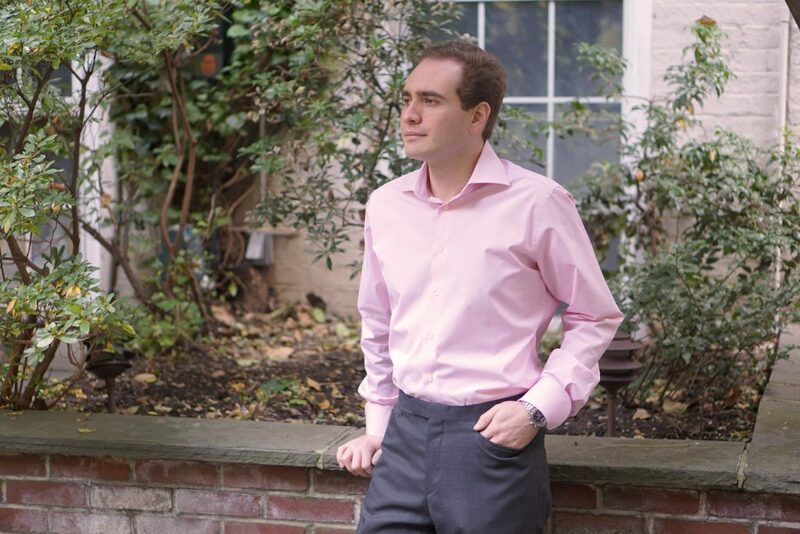 The shirt is made of a fine 120s cotton in pink and white end-on-end to give it a similar look to the pink linen and cotton blend shirt that Sean Connery originally wore in You Only Live Twice. Though end-on-end cotton is much more formal than a linen blend, in the form of a long-sleeved shirt with cocktail cuffs I have more use for cotton than a linen blend. Unlike a linen shirt, this cotton shirt can be worn year-round, and I will be wearing it with either a suit and tie or to work in my business casual office. With the Special Order program, I was able to choose the collar, cuff and front styles of the shirt. This is not a bespoke shirt, but there is a great wealth of options. 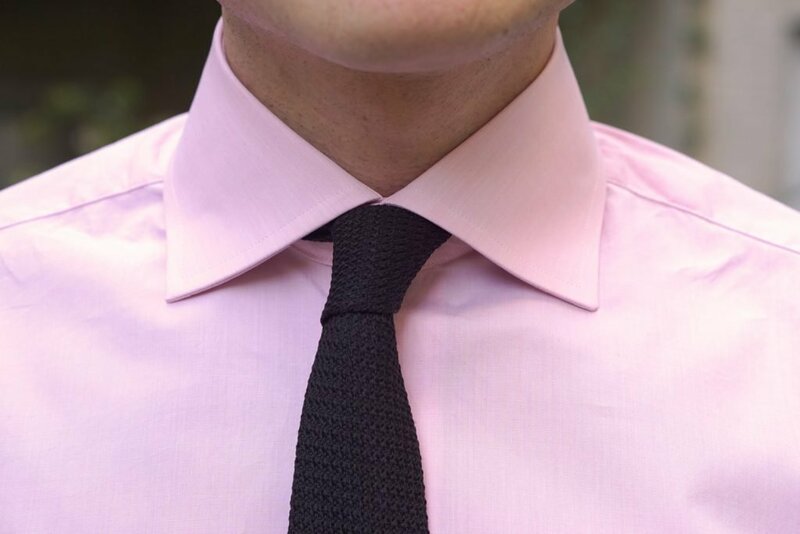 The collar is the Deep Semi-Cutaway collar, which has a point length of 8.5 cm rather than the 7.5 cm (3 3/8 in) of the regular Semi-Cutaway collar. The back of the collar is 4.5 cm (1 13/16 in) tall, and the spread width is 15 cm (6 in). Overall the collar has the look of a classic spread, but the lack of tie space gives it a more continental than British look. This collar design—only one of many—is perfect for my face and also very similar to Connery’s collar. The firm, but not stiff, fusing also gives the collar a more continental look and feel than British. Unlike in a jacket, fusing in a shirt is a matter of taste rather than a sign of quality, and the shirt is impressively made in Switzerland. Though I personally prefer a collar with a sewn-in interfacing, this collar has a fantastic feel and requires hardly any effort to iron. The collar is stitched 7 mm (just over 1/4 in) from the edge to give it extra presence. When worn without the collar stiffeners (as in the photos), the collar still sits firmly against my chest but has a soft roll like what can be seen on Connery’s shirts. The longer collar points in this shirt help make that possible for me, while shorter collar point will be less likely to sit against my chest without help from the collar stiffeners. Slightly shorter collar points of around 8 cm (like on the collar on the ready-to-wear Anthony Sinclair shirts) would be more of a standard size and closer to what Connery wore. The collar is pictured with a black grenadine tie from Anthony Sinclair. The cuffs are cocktail cuffs, since I couldn’t get a shirt from Anthony Sinclair without the classic Connery detail. Like the collar, the cuffs also have a fused construction, but the fusing is very light and soft so that the cuffs can fold over smoothly. The cuffs have a slightly different design from the cocktail cuffs that Connery wore. This cuff design is meant to fold flatter than Connery’s (which roll rather than fold), but it still has the same scalloped shape that makes Connery’s cocktail cuffs so elegant. Not even Turnbull & Asser will make such a rounded cocktail cuff today. Because the turned-back portion of the cuff is designed to curve separately from the base of the cuff, the cuff would not look right if I only fastened the first button like Connery does in You Only Live Twice. Because this cuff is designed to fold rather than roll, both buttons must be worn closed on this cuff. For the front, I opted for a plain front rather than a placket like Connery’s original pink shirt has. The modern Anthony Sinclair shirts have a placket stitched at 7 mm from the edge rather than further from the edge like English shirts traditionally have, and I prefer my plackets to have a more English style. There’s nothing superior to one design or the other, merely a matter of personal taste. I love the clean look of a plain front, so I chose that, and it looks fantastic with or without a tie. It’s done very well with seven buttons down the front of the shirt and a high first button at 5 cm below the collar. The pearl buttons are more continental in style and on the thicker side at 2.5 mm thick. The front has no line of stitching; it has a clean and elegant look with only the buttonholes keeping the front piece together. The back of the shirt has a split yoke cut on the bias and darts at the waist. The tails are curved and have a matching gusset for reinforcement. The sleeves are attached to the cuff with three pleats and feature a gauntlet button. Because this is a Special Order shirt, the fit was slightly adjusted from the fit of a standard slim fit shirt. I tried on the slim fit shirt in my closest size. The fit of the body is from one size smaller than the collar is. Adjustments were made to the sleeve length, cuff circumferences and collar position. The cuff circumference was made smaller for my wrists, and the left cuff was made 1 cm larger to accommodate my watch. 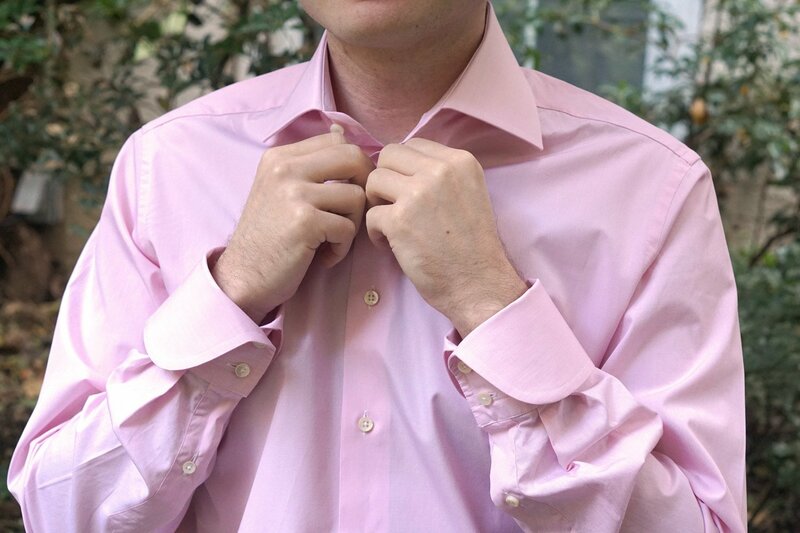 The collar was lowered to eliminate a wrinkle on the front of the shirt below the collar. For those who prefer a closer fit, that is certainly possible. I wanted a more relaxed fit like Sean Connery’s shirts have, though my shirt will still likely experience slightly more shrinkage in the next wash or two. 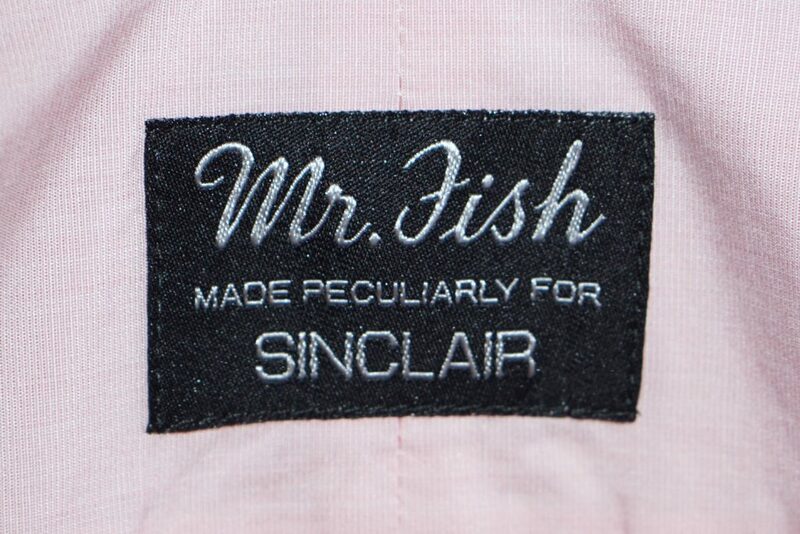 The shirt’s label is branded under both Anthony Sinclair and Mr. Fish, whose founder Michael Fish assisted Sean Connery at Turnbull & Asser for his cocktail cuff shirts in Dr. No before going off on his own. 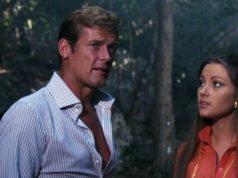 David Mason informed me that the branding of the James Bond-styled shirts will be reverting back to Anthony Sinclair, with “Mr. Fish” being saved for the flashier styles that the company was famous for designing in the late 1960s. For the trousers, we copied the look of the flannel ready-to-wear trousers that Mason & Sons now offers, but David found for me the perfect cloth to match the lightweight wool trousers that Connery wears with his pink shirt in You Only Live Twice. We chose a three-season weight plain-weave dark grey worsted, which should be ideal once spring comes. The only change in style from the Anthony Sinclair ready-to-wear trousers is a hook-and-eye extension fastening instead of the button, just like what Connery wears. The defining detail of these trousers is the frogmouth pockets at the front. 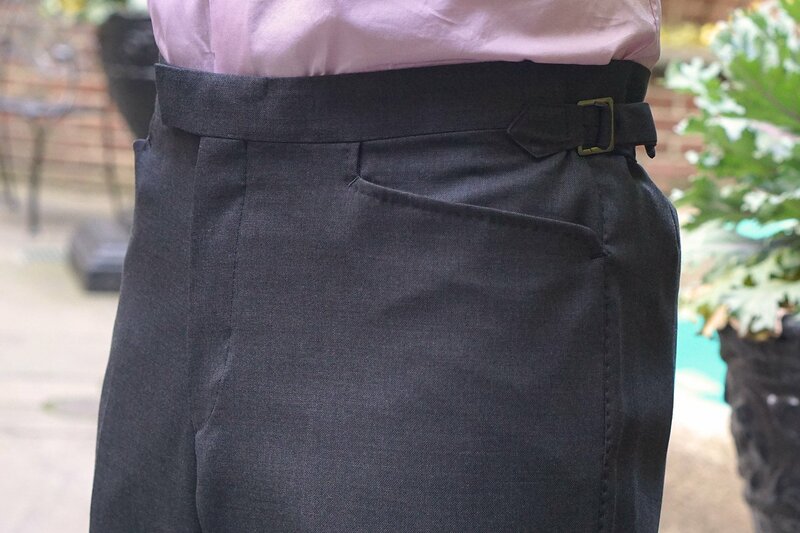 Compared to standard side pockets, frogmouth pockets give the trousers a sportier look and a cleaner fit around the hips, but they are less forgiving. Considering how dressed-down today’s society is along with the love of a tight fit, it is a wonder that frogmouth pockets do not dominate current fashions, let alone haven’t come back into fashion at all. Though frogmouth pockets may be a 1960s and 1970s trend, they are at home amongst today’s fashions. This is my first pair of frogmouth trousers, and as someone who does not wear jeans, these will take some getting used to. The Special Order system that Anthony Sinclair use does not do the button-tab “Daks tops” style of waistband that Connery wears. Instead I got the slide-buckle side straps, which are much more functional in my experience. The waistband is split in the back for more comfort. Like on Connery’s trousers, there is one rear button-through pocket on the right, and the legs are finished with a plain hem. There are dual darts on each side of the rear of the trousers to provide enough room in the seat. These trousers have a similar fit to my Anthony Sinclair Special Order suit trousers, but we decided to lower the rise very slightly for a more versatile look without a jacket on. The design of these trousers is ideal for wearing with a blue blazer or casually without a jacket like Connery wears his trousers. Together, the pink shirt and grey trousers make a beautiful combination. Alone they can be dressed down as Connery wears his in You Only Live Twice. Or I can throw on a navy blazer or grey checked jacket to dress up the outfit, and add a grenadine or knitted tie to dress it up even more. You will notice that my shoes are loafers (from Ralph Lauren) and not sandals. Though You Only Live Twice‘s costume designer felt it appropriate to copy Ian Fleming’s Bond on this matter, my choice is for more sophisticated casual footwear. What a great colour combination. I like that a lot. Why does the label say “Made peculiarly”? I’m pleased to hear they now cater for the peculiar (gives me hope) but it’s a strange slogan. If I recall correctly, this is a homage to the nametags on the original line of Mr Fish clothing. A few years ago I purchased an Anthony Sinclair special order shirt to replicate one of my favorites from the series as well, the one Roger Moore wears outside the Bottoms Up club, which I happened to wear last Thursday! Here’s the one I mean. 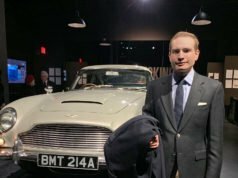 David Mason has done a great service for us Bond clothing geeks and for the well-dressed in general in reviving this brand. Excuse me, can Mason and Sons make a flared link button cuff? The only other Savile Row tailor I have seen make such a cuff other than Cyril Castle is Dege and Skinner. Mason & Sons can make the flared link button cuff on bespoke jackets, which they did for the Madame Tussauds exhibit. But Kyle was talking about a replica of Moore’s shirt. I have to be honest, if I could, I would rob your whole wardrobe. The shirt, and pants are entirely too big, a couple sizes too big for your body. You can see the material bunching, creasing, and sagging in a multitude of different places. The pants are huge. The seat isn’t probably aligned where it should be, and hangs off way too much. The cutaway collar is counter intuitive to what you would need as your face is relatively wide, and large. A pointed collar that narrows your face would be better suited. Are you judging the fit of the shirt by current fashion standards? The shirt certainly has a large fit in the body, but that’s how shirts traditionally fit. The collar, cuffs and sleeve length are all perfect. The trousers have a close fit are not at all too big. Any smaller and I couldn’t get them on! The clothes are not bespoke, so there’s only so much than can be done about the fit. The shirt needed to be washed again to get in a bit more shrinkage, but I didn’t have a chance before the cold weather set in to wash it again before I took the photos. The collar is narrower than a cutaway, rather a classic spread. I would never choose a cutaway collar. Narrow point collars are not the best choice for a wide face as they can accentuate how wide a face is by contrast of the collar width. I chose the second narrowest collar they have. I think the fit looks fine. Have you had any further thoughts on the frogmouth pockets since this post? Is it something you would recommend on odd trousers and/or suit pants? Compared to side pockets, I find frogmouth pockets to be feel tighter when seated and are more difficult to access. But items in the pockets feel more secure, and they have a unique, clean look. What exactly is the cloth used for the trousers ? Is it a simple serge ? Or pick-and-pick ? As I wrote, they are a plain-weave worsted. Caleb Daniels on Casual Wear in Haiti: Black Polo and Off-White Jeans in Quantum of SolaceWonderful, thanks!